After sampling this refreshingly intriguing salad at Publix, I had to have more. Publix gives you the recipe, but I modified it a little, and wanted to share. I know it sounds strange, but the flavors really work well. 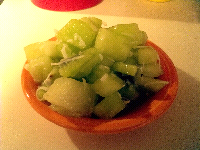 Place kiwi and honeydew into a large bowl. In a small bowl, combine Ginger ale, ginger, coconut, and sesame seeds; stir. Pour over honeydew and Lewis; stir to combine. Serve or refrigerate for later use.